The Erie County Legislature unanimously passed a resolution proclaiming January 2019 ‘Slavery and Human Trafficking Prevention and Awareness Month’ in Erie County. In conjunction with state and nationwide efforts, human trafficking prevention and awareness month draws attention to the prevalence of human trafficking and urges people to spot the signs associated with it. According to the U.S. Institute against Human Trafficking, there are roughly 40 million victims of trafficking worldwide. 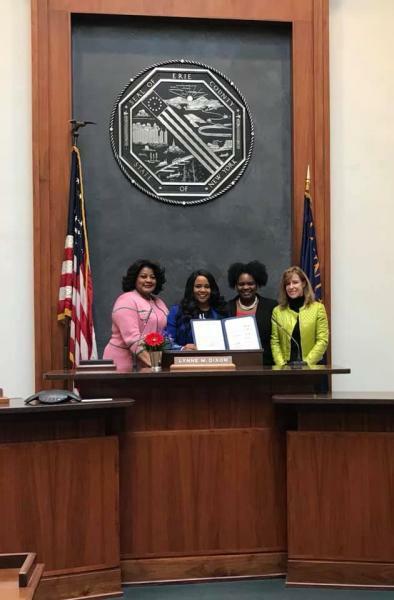 Thursday afternoon, Legislator Dixon was joined by Legislators Barbara Miller-Williams and April Baskin to present the proclamation to Kelly Galloway of Mona’s House Project, which is an organization devoted to spreading human trafficking awareness and helping its victims. More information on Project Mona’s House can be found here. A copy of the resolution can be found here.